Sundays high temp should be about 73, Monday will see 78 with dew points of around 61 with a cold front on our door step by about 7pm. IMO severe weather is possible Monday evening, what mode it will be I don't know yet, will try and post later as to what I think will happen. excuse me I forgot to say what I'm basing the forecast on. It's a 50/50 blend of the UKMET and the ECMWF, the last two runs of the models are in agreement that the 570 isotherm on the 1000-500mb level we reach into southern MN during the day on Monday. Given the fact that these two models are higher resolution models than the GFS/NAM I am going with those. @big daddy kudos goes to you as well with your 7:34am comment on the other post,about how if the clouds don't break we won't reach the 70's. Novak nailed it first. He rocks with forecasting!! For Monday things looks very interesting for MSP and points south and east. The Euro forecast sounding for Monday night 7pm at Rochester shows Surface based CAPE close to 1100 , with a lifted index value of -5. The winds at the surface should be out of the SE but at the 500mb level they should be out of w/sw, so directional sheer is strong. But the speed shear weakens at the mid levels, in other words the winds at 500mb are not great as far as speed. (they do get stronger above that level). If this holds true I think that the SPC will put us in a slight risk for Monday. Currently my AMATEUR eyes are thinking this, severe hail is a possibility but it should stay around a inch in diameter, strong winds and a possible weak tornado is not out of the question. Stay tuned to you favorite weather outlet for more detailed info. The US models do not show this at this time. We will see what they show with tonight's runs. Stay tuned!!!! When I looked at the radar this evening, I see a whole bunch of boundries on the radar. Can sombody give me an explination of what they are? Outflow? Fronts? I cant be sure. A double-busted forecast. 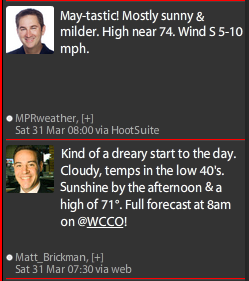 1 for the Saturday forecast from Friday, and then the same-day nowcasts calling for 50's to 60 (as shown by the tweets above) when it only reached 50 for a couple of hours at MSP. 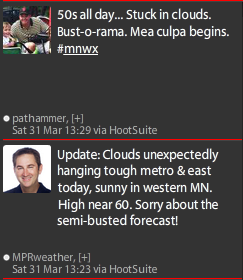 @MN WeatherFan: I agree. Noted the same thing. The only thing more annoying than today's weather are those idiotic quasi-apologies. Good grief. Well,get ready for more busts and idiotic quasi-apologies.......those highs of 70's to low 80's just forecasted 48 hours for today will not materialize...........60 will be a stretch today! big daddy, it really is looking that way. Among the many things that March 2012 showed us was that meteorology cannot reliably predict cloud cover. The forecast high today is 75, but it's still overcast. Seems like we'll be lucky to see 60. @MW thanks for the earlier props.............still cloudy and 40's at this hour........smells like a 30-degree bust with all the 80's that were thrown around during the week! Yup sun is out here in Golden Valley,@Randyinchamplin looks like some warmth will be salvaged,but not thinking we will hit the 80's that a bunch of locals advertized earlier this week. Temps responding to the sun,up to 49 at the noon hour.What do you think we will hit today randyinchamplin and big daddy,is 80 still a possibility? going for 68 here in the metro, the 70°line should get as close to the metro as St Peter to Gaylord area. mid 80's to low 90's possible in far south western MN...Gulp did I just say low 90's for April 1st?? yikes, that ain't no joke. Was going to say the same as Randyinchamplin,so as to not being the same I'll go with 67! Anyone agreeing with innacuweather's 91% of tstorms tonight?! another record set??? this spring is just down right crazy. MPX will be working with the MN Climate folks to confirm if this is the earliest 90° ever recorded in MN. Yuhas is still up to strange things: 1) This morning he tweeted "thunderstorms late tonight"... no chance of, just certainty, 2) he tweeted early this afternoon: "Temps will climb to 60 at 3pm then 65 at 4pm and close to 70 by 5pm." MSP temperatures for those hours were 64, 66 and 66. What IS it with this guy's preoccupation with sounding so certain about everything? Other than the rain, it sounds like Yuhas was just about right! If you're an hour or two away, you should be able to predict with more accuracy... or it doesn't seem like it's worth bothering. Paul Douglas in his blog today talked about a possible frost at the end of next week or into that weekend. The GFS is showing a low of 28 for 4/13. This is hilarious to me. We couldn't get an accurate temperature forecast for this past Saturday even four HOURS out. It's ridiculous that anyone would put any confidence in a forecast 11 days away. At the rate we're going, just throw some darts and pick the numbers they land on. That essentially carries the same accuracy as any forecast model. My forecast for 4/13: high of 122, low of -38. Maybe frost means some snow for 4/13. I will keep my eyes peeled. This could be the record latest snowstorm ever. PWL what has gotten into you,how many times are you going to be told give up on the snow already,there is nothing on the horizon remotely close to a snowstorm,except maybe in your mind,frost means just that frost,last I checked you don't measure frost in inches,and if your going to make a statement about records have your facts first,April 27-28,1907 holds the record for the biggest and latest snowstorm with 13.5 inches,not April 13 like your implying in your post. Daninduluth. Thanks for sharing the record with me. I can hold out hope throughout april! !